When it rains, the water falling from the clouds is completely soft, it is not until the rain hits the ground that it begins to absorb minerals such as calcium and magnesium found within the earth. 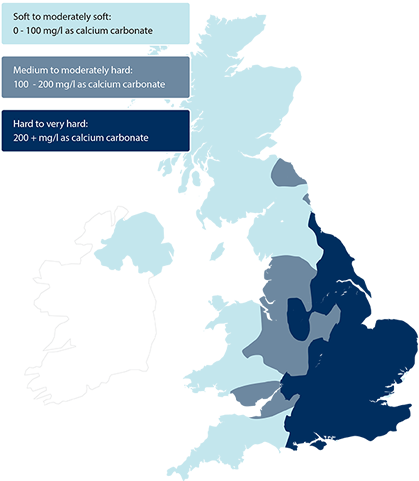 These minerals, whilst natural, create scale build up causing hard water damage throughout your home. Drinking water must comply with regulations, these state that the maximum limit of sodium is 200 mg/l (milligrams per litre). This sodium limit will be exceeded where the water is extremely hard, for example above 425 ppm. This is assuming that the sodium level in the public water supply is zero. Your demonstrator will test your water for hardness. We will ensure your water will not exceed 200 mg/l when softened. A separate unsoftened drinking water tap can be fitted if the sodium limit does exceed 200 mg/l or if you would prefer a hard water supply. This should preferably be at the kitchen / utility sink. It is recommended that softened water is not used for baby feed preparation, particularly for those six weeks and under. Take a look at the baby feed instructions for advice. Some babies’ kidneys are not fully formed and the baby feed is created to contain the correct amount of sodium. The additional sodium in softened water upsets this balance and some babies have been known to suffer from dehydration. If you have been advised by a doctor to be on a low sodium diet, it is recommended not to drink softened water. Why Do I Need To Put Salt In My TwinTec S3 Water Softener? A water softener works by removing the magnesium and calcium present in your water supply through a process of ion exchange, turning it from hard water to softened water, this is done in the softeners two cylinders. Both cylinders are filled with resin that traps the calcium and magnesium hardness minerals allowing only softened water to enter your home. Harvey block salt is dissolved and the brine solution used to regenerate (clean) the resin tanks. This brine also provides the sodium needed to complete the exchange process during softening. How Much Will My TwinTec S3 Water Softener Take To Run? Usage for a water Softener is difficult to predict, as every home is different, factors affecting it can be anything from the number of people living there, how hard the water coming into your home is, to whether you take a large bath or a quick shower everyday. However the TwinTec S3 Water Softener is the most efficient on the market and because its a metered system it will not regenerate unnecessarily. The general rule we go by for usage, is that for every 1 person living in the home, you would use approximately 1 block of salt a month. So for example in a 2 person household would use 2 x 4kg blocks of salt a month. 2 x 4kg Blocks of Harvey Salt costs £5, therefore the running costs would be approximately £5 per month. Do Water Softeners Work With Combi Boilers & Pressurised Systems? Yes, the TwinTec has a high flow rate and is designed to work effectively with both traditional and more modern, direct feed mains systems. Where Can I Have My Water Softener Installed? Every home is different, but ideally the Water Softener needs to be installed near the stop tap. Most Water Softeners are usually installed in a cupboard under the kitchen sink, but Ian will advise and help you choose the most convenient and cost effective place to install. Sometimes customers don’t want to lose kitchen cupboard space, so they can be installed in the garage, under the stairs, in the loft or even outside, in one of our insulated cabinets. We are always happy to work with customers requests.